Get the ultimate multimedia experience with Satio. Feast your eyes on movies, TV-series’ and video clips thanks to the 3.5 inch screen and crystal clear 16:9 widescreen format – just like watching them live. A friend pulling a funny pose? Snap them with the amazing 12.1 megapixel camera and share the picture with friends. 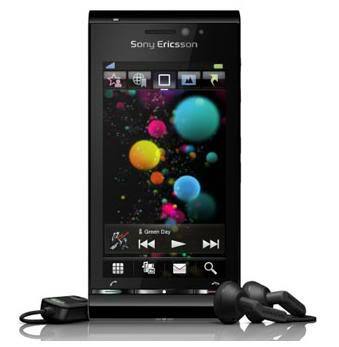 London, UK – May 28, 2009 – Sony Ericsson today announced Satio which provides you access to all your media in one place – just tap directly into your favourite features with the five standby panels and you’re ready to go. First introduced in Barcelona as the ‘Idou’, Satio puts the future of mobile entertainment in the palm of your hand. You can watch your favourite movies on the bus or catch up with your TV shows while on your lunch break thanks to Satio. Download exciting music, movies and games from PlayNow arena to personalise your entertainment experience on Satio and enjoy them in crystal clear 16:9 widescreen format. PlayNow arena provides a full range of mobile entertainment available by dual download to both your PC and mobile phone with specially developed ring tones and music tones and DRM-free music tracks and TrackID charts from around the world. To make your listening experience even better team Satio with the smallest headset on the market, the Wireless Stereo Headphones HBH-IS800 to listen in crystal clear sound. Alternatively, maximise your mobile video experience with the Video Viewing Stand IM920. Satio supports GSM/GPRS/EDGE 850/900/1800/1900 and UMTS/HSDPA 850/900/2100. Satio will be available in selected markets from early Q4 in the colours; Black, Silver and Bordeaux.